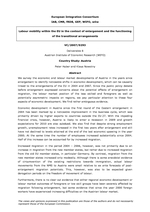 This study provides a summary on the extent and structure of Romanian permanent and temporary emigration since 1989, its institutional framework, and its economic consequences in Romania. Romanian out-migration has evolved dramatically in the past fifteen years, starting from low levels and the predominance of permanent migration, to assume diverse forms and targeting new destination countries, particularly Italy and Spain, by the new millennium. The stocks of Romanian nationals in these countries increased considerably between 2001 and 2003 in particular. The characteristics of the migrants have also changed, nowadays females provide almost two thirds and prime age individuals provide for half of all permanent migrants, against a higher share of both dependent minors and elders in the early 1990s. Existing evidence suggests the overproportional participation of the better skilled in migration, pointing at the risk of brain drain. Other effects on the Romanian economy include the emergence of labour and skill shortages that may necessitate higher levels of immigration to Romania, as well as the inflow of large amounts of remittances, that are rarely used for investment though. Based on the existing characteristics of Romanian international out-migration, we do not expect a substantial decrease of migration outflows in the short run.